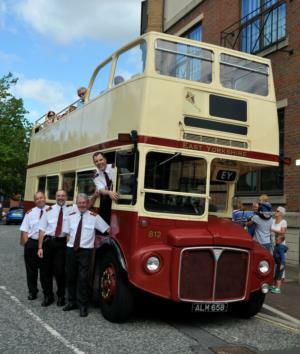 The eighth EYMS ‘Big Bus Day', which has already become an eagerly awaited annual event at Hull's Streetlife Museum of Transport, was held last Saturday and easily beat the previous record for the day with over 5,600 people attending and around £2,500 raised for the NSPCC. Previous ‘highs' were 4500 visitors in 2011 and £1500 raised last year. Undoubtedly the much publicised appearance of a New Bus for London was a major attraction but the event seems to go from strength to strength and the fine weather on Saturday no doubt also helped to draw the crowds. EYMS Chairman, Peter Shipp, said "I am absolutely delighted that this has now become such a popular event, not only with bus enthusiasts, and I and the EYMS team were very pleased to meet so many of our passengers and other people and families from our local community". "To have beaten previous attendance records by well over 1,000 was a major achievement, and big thanks go to all our 24 volunteer helpers, including present day staff, some of their family members, retired staff and one or two enthusiasts who all volunteered to help out on the day. Thanks also to Robin Diaper and his team at the Museum who as always made us welcome and were a great help both before and on the day". "I must record special thanks to Sam McClaren, Commercial Director of Wrightbus, the Ballymena-based bus builders who are building the London buses, for his ready agreement to divert one of these amazing buses on route to London, and to Transport for London and the GoAhead Group who will operate this one in the Capital. Both organisations also readily agreed to my rather cheeky request and so enabled this possibly unique event to take place". Councillor Geraghty, Portfolio Holder for Leisure, culture, events and public wellbeing at Hull City Council said: "I am delighted that the Big Bus Day has proved the most successful to date, with the popular Streetlife Museum being an ideal location for the annual event"
"This is one of many very successful cultural events that have taken place this summer, contributing to our bid to become City of Culture 2017." 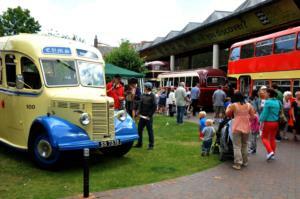 Crowds gather at Big Bus Day 2013. Our drivers had a great time driving the vintage open top buses in the sunshine. 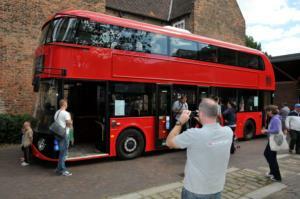 Visitors admire the New Bus For London.